The beauty of technology is that it allows you to virtually be in a place you can’t physically get to. The other morning I sat in my living room and watched a wedding video sent from a friend across the ocean. It was beautiful, lots of lace and tulle! Most noteworthy was the flower girl, taking step by measured step, to prepare a pink petal path for the bride. One look at that sweet face and you knew she was more than nervous. Her hands were clenched around the handle of a white straw basket filled with soft, pink rose petals. It almost looked like she was holding her breath, concentrating on the task. She kept her eyes on the groom who smiled encouragingly and she set off one step at a time. The congregation was smiling and silently cheering this little forerunner of the bride. She measured her steps and at each pause she tossed a few of the petals onto the aisle clothe, creating a lovely pink path for the brides walk. Halfway down you could see her begin to relax a little bit. Glancing sideways she saw her dad giving her a big thumb’s up and her face broke into a smile. A few more metered steps and she was standing at the front visibly relieved, yet beaming ecstatically. She did it! I turned off my computer and shed a few tears for the beauty of it all. And I couldn’t help but think the little flower girl’s journey is a wonderful picture of the road we often take to realizing a dream! I learned some things from that little wedding video, things God has been reminding me this week. The problem with breath-holding is it can be paralyzing. Eventually we pass out and miss the grand adventure ahead of us! It’s almost always fear that causes that sharp intake of breathe. The God of the universe reminds us His perfect love leaves no room for fear. Breath in the grace and mercy of the one who birthed your dream in the beginning, and breathe out praise and thanks for all He is going to do. When fear makes us breathless, love helps us trust the One who says Fear Not! Sometimes, it seems like God’s timing has stopped all the clocks. Overwhelm steps in and makes us want to run ahead! But one measured step at a time means eventually, we’re there. The thing about a journey to a dream is we never walk on our own. The God of the universe walks with us and His timing is perfect. When we keep looking to him, there is always love and encouragement. 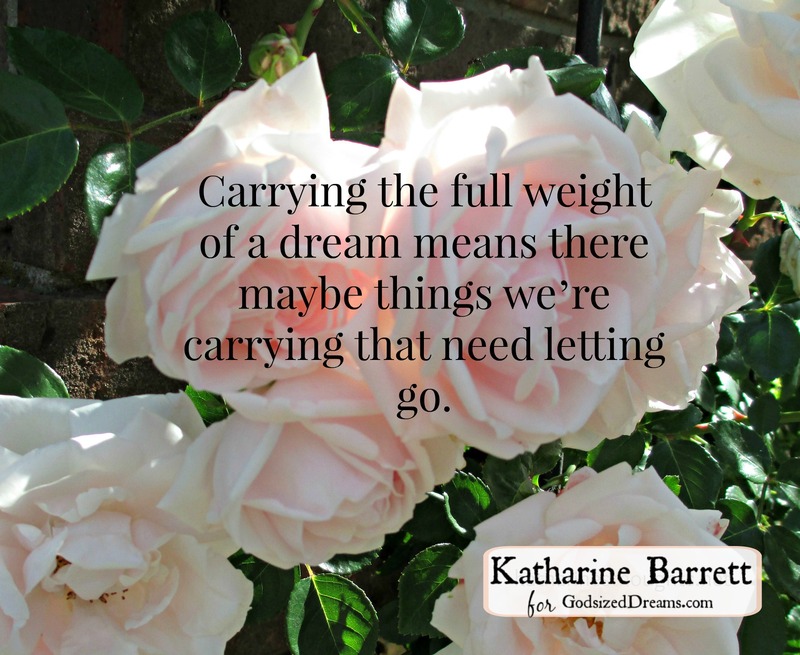 Carrying the full weight of a dream means there maybe things we’re carrying that need letting go. Petals of comparison, fear, envy, self-doubt, or self-pity can make for a heavy basket. Asking God to help you release them will leave room for His love, strength and comfort. In addition, those things you’re letting go of may help create a path of experience, inspiration and hope for other dreamers behind you! Finally, look around. This dream we have, the one that goes deep and refuses to leave, it can be consuming. Journeying towards it can mean we focus all our attention on putting one foot in front of the other. Sometimes, that focus can be isolating and often lets in lies that can halt a dream. The ones that say “I’m not good enough” or “Maybe this isn’t what I should be doing.” When we lift up our head, we see others around us, smiling and cheering us on. Dreams need community. Find the one, two or twenty that you trust with your heart and talk with them. Let them walk with you. 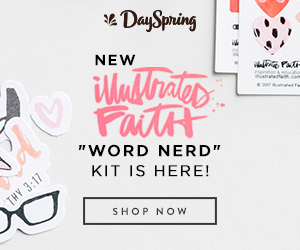 They can help sift through the truth and lies, confirming what God has placed in your heart. Look around and you might just see a friend with a thumbs-up! Katharine Barrett is a writer, an author, an occasional speaker and a dreamer. She is on a journey with the God of the universe, discovering who she was created to be and what it means to walk living loved in everyday grace. Katharine makes her home in Ontario, Canada where she shares life and laughter with her husband and four children. She blogs at Katherine's Thoughts, always listening for His heart and never without a cup of good coffee in a great mug! 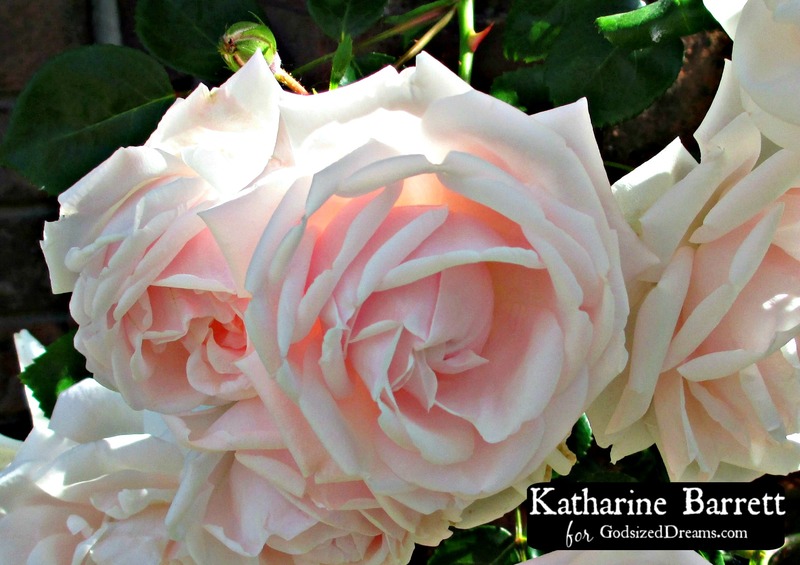 Katharine, this is beautiful: “Petals of comparison, fear, envy, self-doubt, or self-pity can make for a heavy basket. ” And it’s so wise. 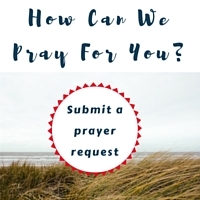 God urges us to throw aside every weight and these particular sins DO so easily beset us. Thanks for sharing that image of petals floating down and a light basket, deep breaths of grace, and a loving Father at the end of the journey encouraging us on the way. Michele, it’s so true isn’t it, it’s easier to walk with a light basket knowing our good God walks with us! Blessings! This really ministered to my heart this morning. Thank you. Oh Barbie I’m so glad. Our good God is faithful, yes? Blessings! Thank you for this, Katharine. I struggle most with the “one step at a time” piece of dreaming. Because of course I should have a best-selling book written in a single day! I have to just shake my head at myself. God’s timing is always good and He never requires that I stress myself out. One foot in front of the other. I like to ask myself, What can I do today? Otherwise I completely overwhelm myself.